Floaters are actually tiny clumps of gel or cells inside the vitreous, the clear jelly-like fluid that fills the inside of your eye. While these objects look like they are in front of your eye, they are actually floating inside. What you see are the shadows they cast on the retina, the nerve layer at the back of the eye that senses light and allows you to see. Floaters can have different shapes: little dots, circles, lines, clouds or cobwebs. When people reach middle age, the vitreous gel may start to thicken or shrink, forming clumps or strands inside the eye. 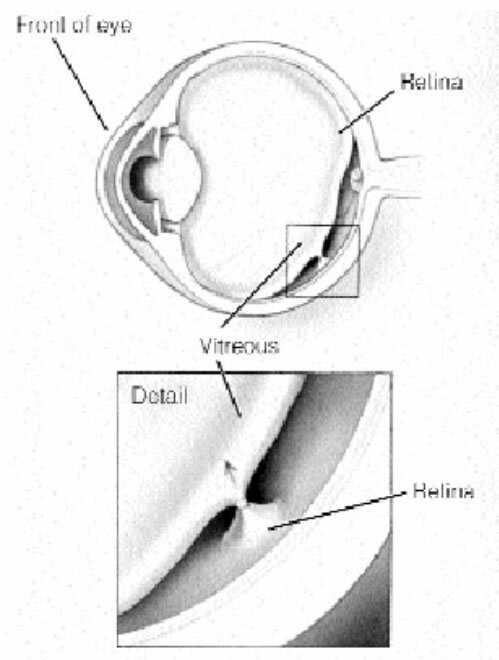 The vitreous gel pulls away from the back wall of the eye, causing a posterior vitreous detachment. It is a common cause of floaters. The appearance of floaters may be alarming, especially if they develop suddenly. You should see an ophthalmologist (Eye M.D.) right away if you suddenly develop new floaters, especially if you are over 45 years of age. 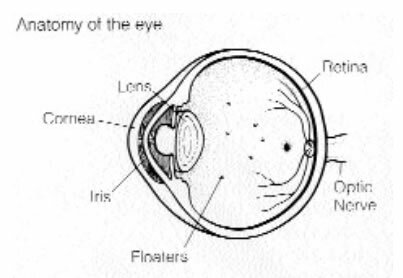 Because you need to know if your retina is torn, call your ophthalmologist if a new floater appears suddenly. Floaters can get in the way of clear vision, which may be quite annoying, especially if you are trying to read. You can try moving your eyes, looking up and then down to move the floaters out of the way. While some floaters may remain in your vision, many of them will fade over time and become less bothersome. Even if you have had some floaters for years, you should have an eye examination immediately if you notice new ones. When the vitreous rubs or pulls on the retina, it creates a sensation of flashing lights. The flashes of light can appear off and on for several weeks or months. As we grow older, it is more common to experience flashes. If you notice the sudden appearance of light flashes, you should visit your ophthalmologist immediately to see if the retina has been torn. Some people experience flashes of light that appear as jagged lines or “heat waves” in both eyes, often lasting 10-20 minutes. These types of flashes are usually caused by a spasm of blood vessels in the brain, which is called migraine. If a headache follows the flashes, it is called a migraine headache. However, jagged lines or “heat waves” can occur without a headache. In this case, the light flashes are called ophthalmic migraine, or migraine without headache. When an ophthalmologist examines your eyes, your pupils will be dilated with eye drops. During this painless examination, your ophthalmologist will carefully observe your retina and vitreous. Because your eyes have been dilated, you may need to make arrangements for someone to drive you home afterwards.